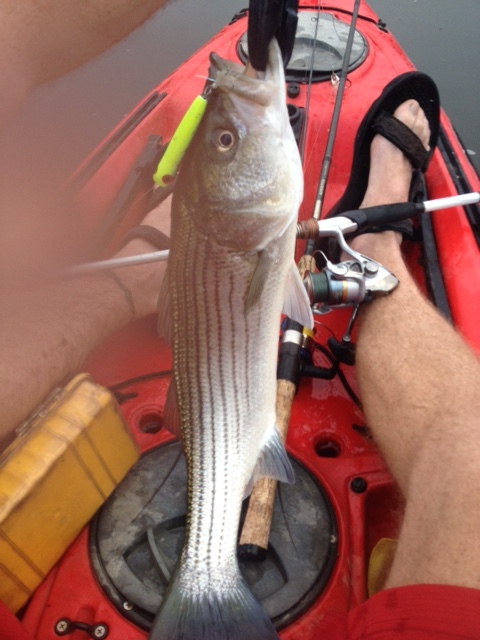 So with the nights cooling off I’ve gotten back on the water for stripers a few times over the last few weeks. Last Saturday morning I hit a lake and found fish eating a ChugBug steady until 9am. The fish were knocking the bait out of the water repeatedly. It was incredible. Literally the best topwater bite on freshwater I’ve ever experienced. 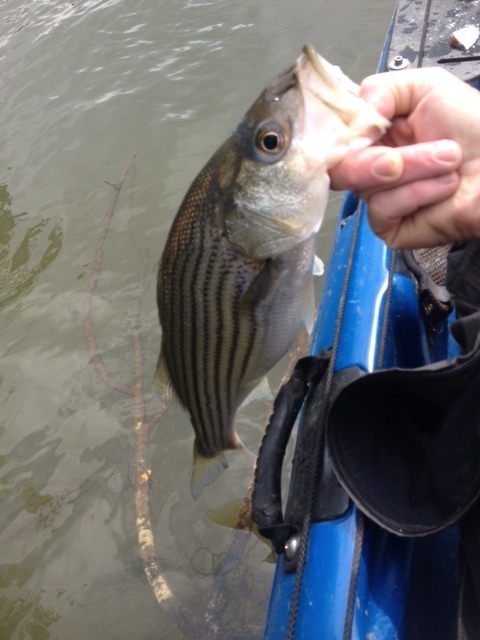 Never had so many fish come back to a bait they’d knocked 10″ out of the water so many times. That post with pics is here. So I went back one day after work and the bite was non-existent in great conditions. It was cloudy, the wind was down and shad came to the surface in many schools a few hours before sunset; but the small baitfish were unmolested. Not a single fish surfaced that afternoon and I finally resorted to a Texas rig to catch one very small largemouth bass. The area was devoid of life. 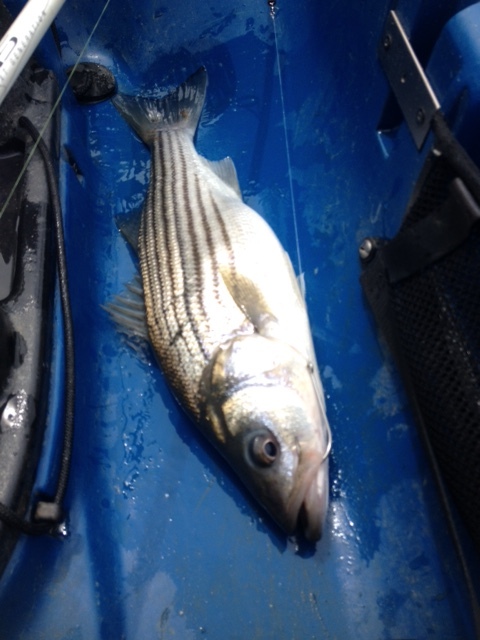 The water is still really warm for striped bass in the afternoons. 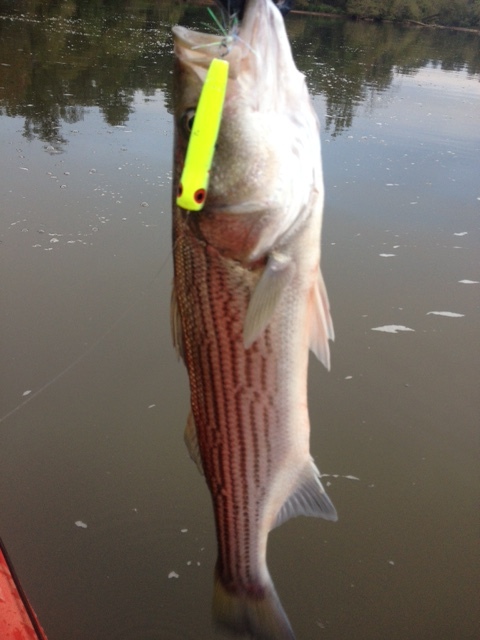 So this am I decided to hit the Cape Fear river and try my luck there. This proved to be a great decision. Literally non stop action til about 8:00am. 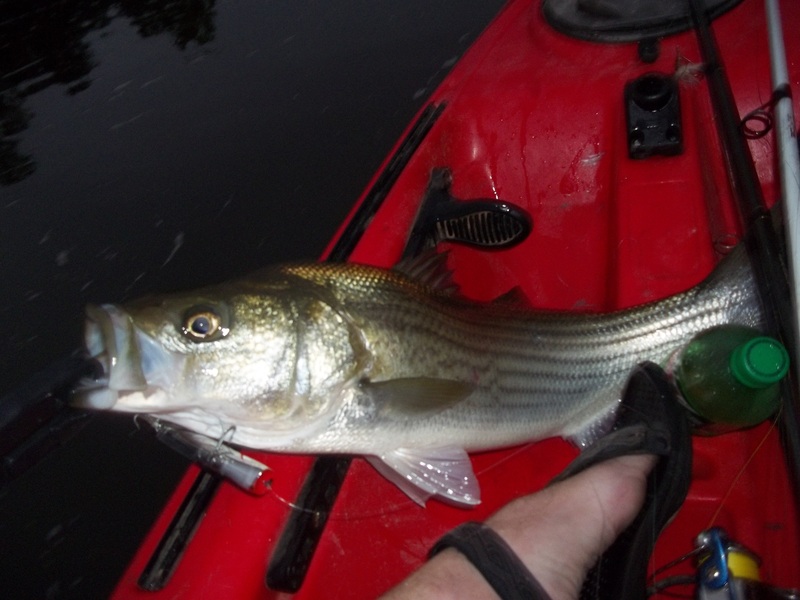 It’s a little unnerving in a river, by yourself, yanking a topwater bait across the water towards the yak in the dark when a fish unloads on it. The sound was violent and water sprayed me all morning. But that’s what getting up at 5am is for… And they kept hitting the ChugBug. Even some nice ones….Biggest one, the Skitterwalk fish, was almost 26″ and not too skinny for a late summer fish, probably 8 pounds. I lost a few too. 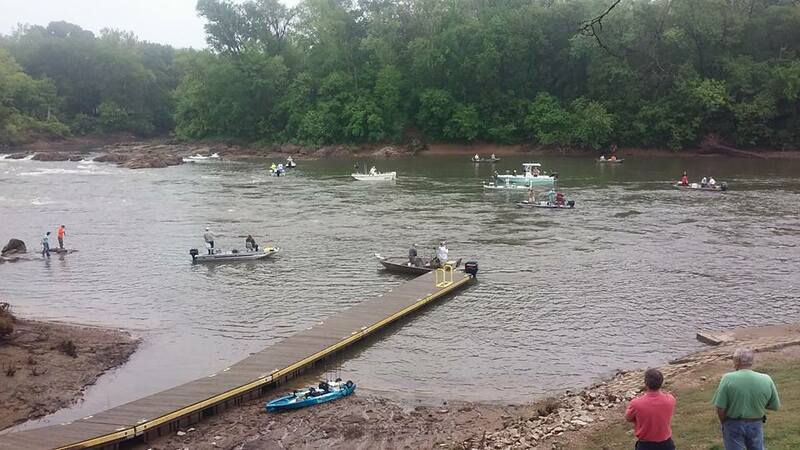 Last weekend not a single fish came unbuttoned, and there were a lot of bass mixed in. This am no bass at all and I had 1 good fish come unglued at the boat. I couldn’t complain though…When the bite slowed at one point, I remembered I had tied a white Skitterwalk on one rod. 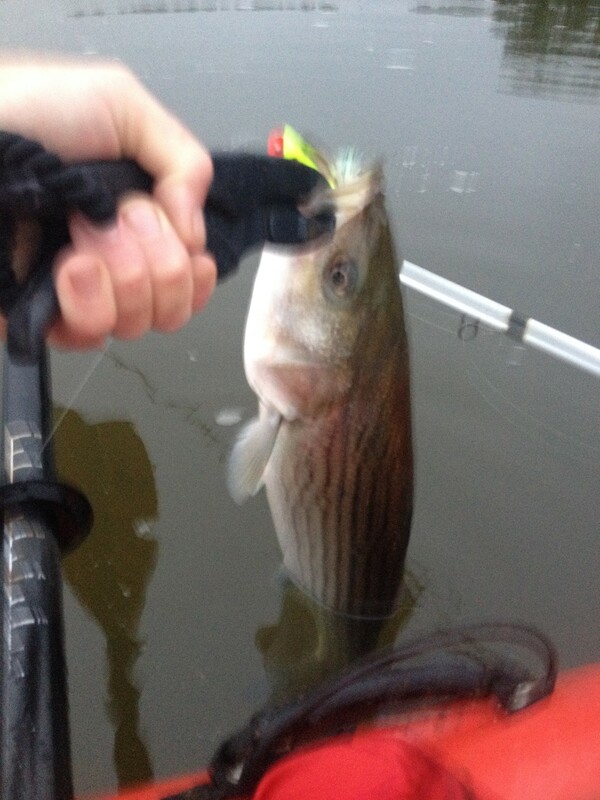 I had never hooked a freshwater striped bass on one so I chucked it out in a lull. First few pops…and this comes on board after quite a tussle…Sometimes a quick change of baits is all you need. The bite died at almost exactly 8:00. I tried to find other biting fish but the area closed for business just like that. As often in late Summer you will see fish bite great for about an hour or two but can shut down quickly in shallow water. I had other things on the agenda for today so I headed out at 9:00. 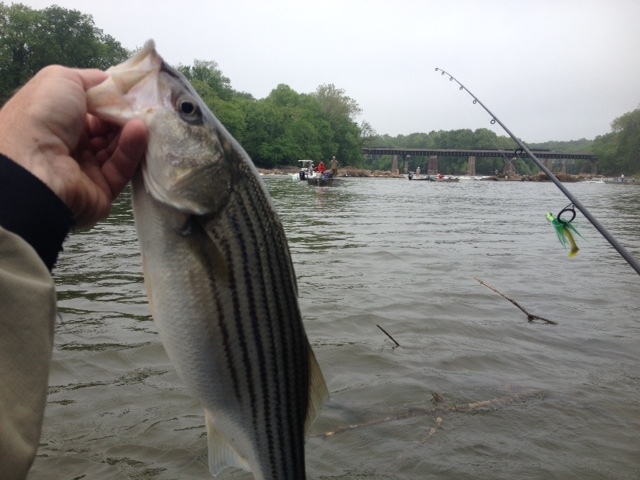 This spring I decided I wanted to try to catch striped bass on all 4 major North Carolina rivers. 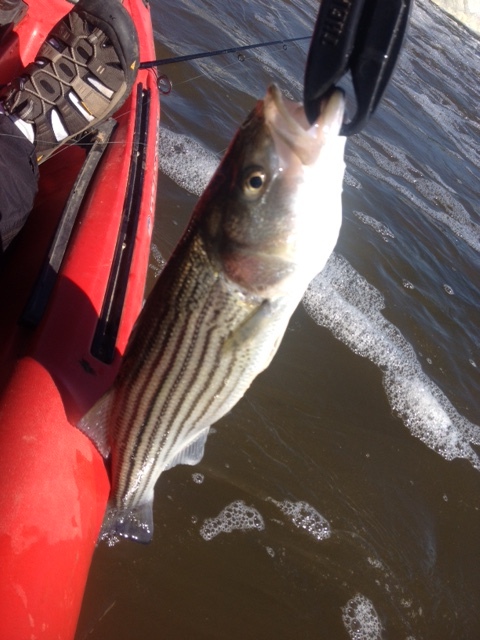 I’d caught plenty of stripers on the Cape Fear and the Roanoke over the years, but before this spring I’d never caught one on the Neuse or the Tar, (I’d never even fished the Tar, much less land an anadromous striped bass there). 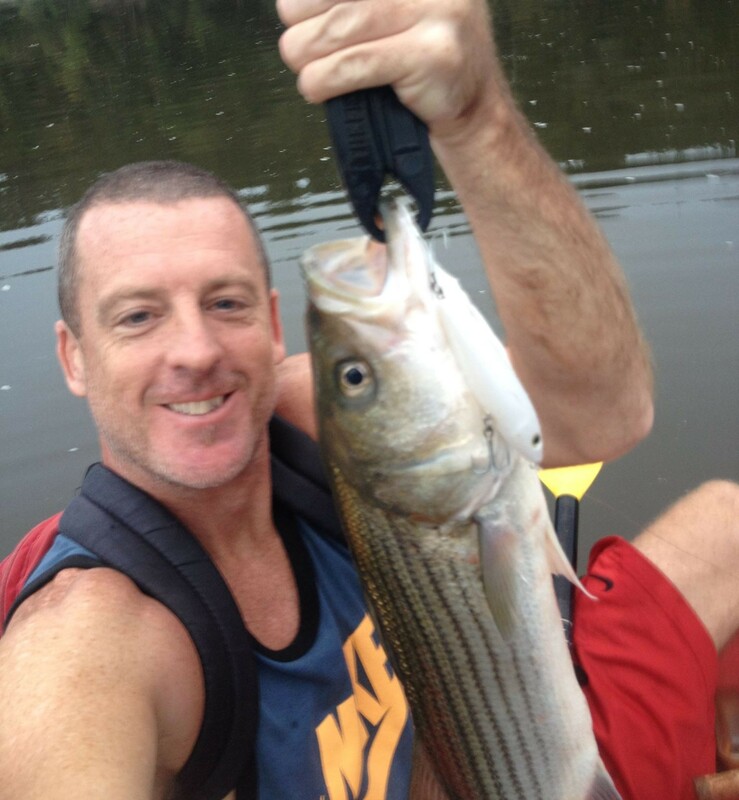 Next, I fished the Tar a couple weeks ago after shocking reports revealed some decent fish around Rocky Mount. I only caught one fish that day. I’d floated down a ways just after dawn throwing a top water lure but had no takers. I noticed a place where a creek ran into the river and anchored up not long after sunrise. 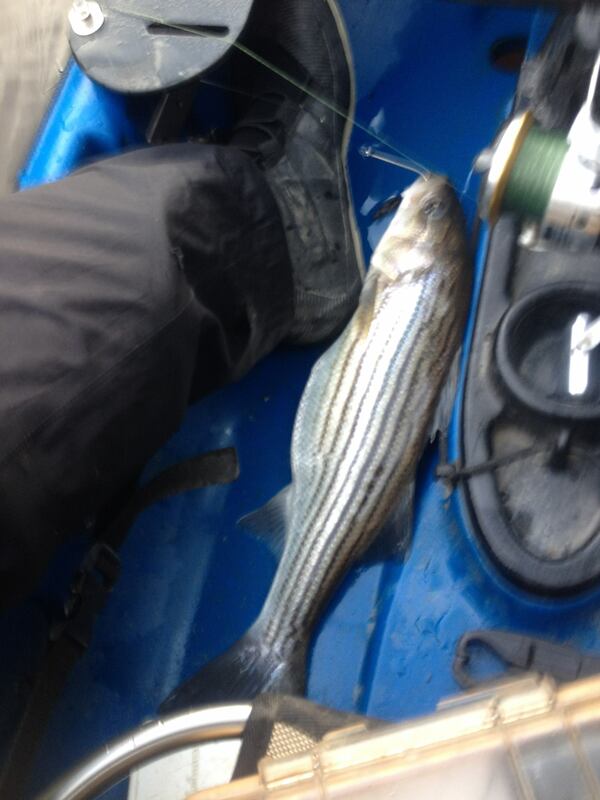 On the first cast I hooked my first ever fish on the Tar; a keeper striped bass measuring almost 21″. This fish was all I caught on the Tar river that day, so after giving in there, I left and launched at the 258 bridge on the Roanoke that afternoon and never caught another fish. It was just a slow bite that day; no matter the river apparently. 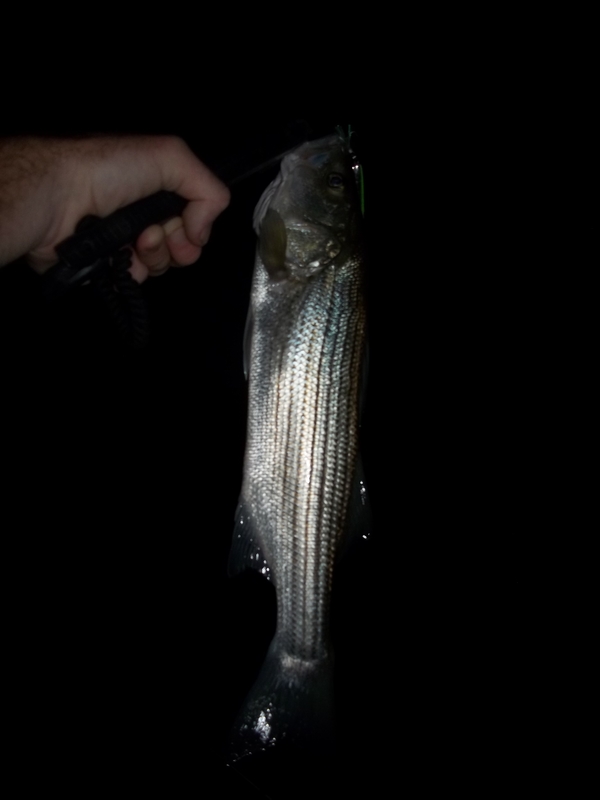 The parking lot was full but I didn’t see anyone catch a fish or hear anyone say they caught a striped bass the entire time I was there. 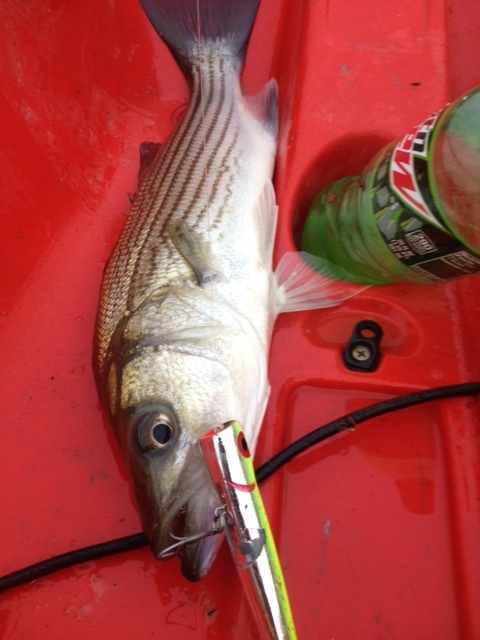 But I had been on the Tar earlier and had a fish on ice, and after catching only slot fish on the Neuse, I at least finally had an ocean running striper in the freezer. Then, this week a buddy and I were talking about a trip to Weldon. But water levels were reported down, so I opted out when we spoke Wednesday afternoon. 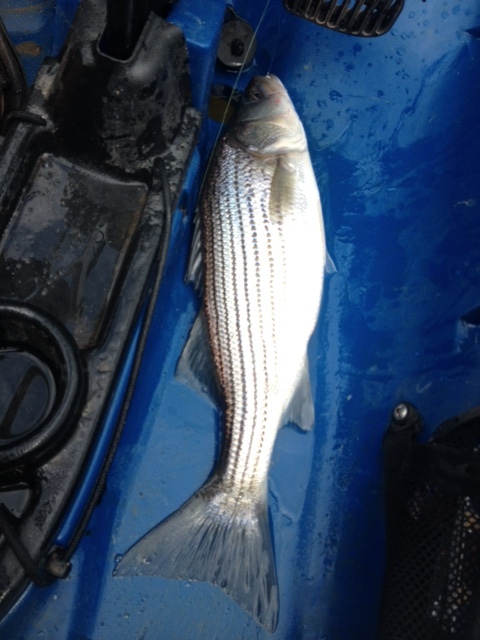 But luckily he decided to go, and thought of me when he started catching fish on every cast this Thursday morning. He was catching his fish in swift water on bucktails and had a great morning. I got the first text at about 7:00am and left the Raleigh area with bait around 8:00. I hoped the bite would still be on. By the time I arrived, the morning’s constant, artificial action was over for the most part, but I found a place to tie up in the fast-moving water and started chunking bait. Cloud cover remained and I was hopeful for a lucky outing. The current is strong at Weldon, and I don’t suggest a kayak trip here unless you are beyond an adept paddler. The traffic is heavy, even on a weekday, and different currents swirl and rip through the area all around the launch where most people tend to fish. Boat wake is also a concern here. It’s really a circus and I’ve always wanted to fish there, but I will say this, be prepared to exercise patience; the close quarters, lower-units being banged and competitiveness of the situation can cause issues. However everyone seemed to be on decent behavior today. 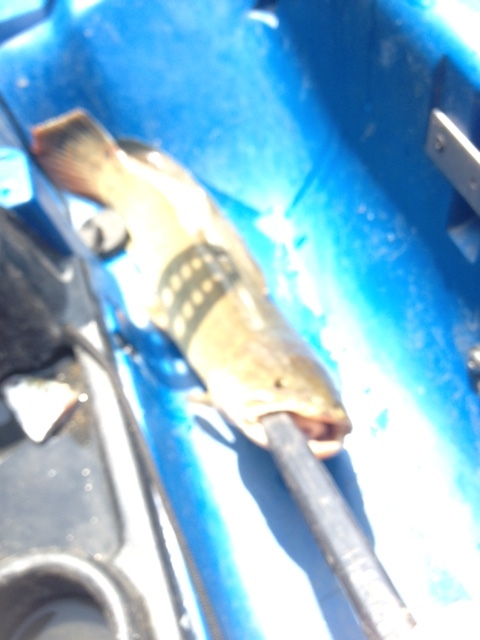 My first hook-up was a channel cat. And then the bite seemed to die for everyone for a little while. I didn’t notice anyone catching up near the rocks, but I had fresh bait so I felt confident. I had several runs soon after, but couldn’t keep anything buttoned up. So after losing 3 fish in a row I decided to change tactics and re-tied a different rig on a lighter weight rod and also down-sized my baits. 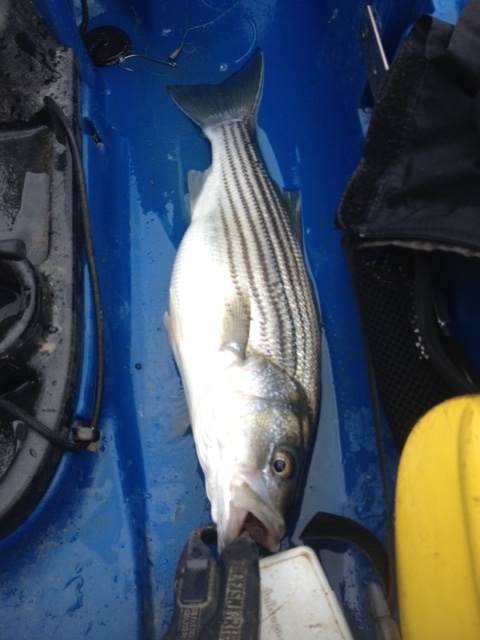 Soon after I was rewarded with my first rockfish of the day. It was a 21″ keeper and it went quickly on ice. I hadn’t even realized at first I’d accomplished the 4 river deal. I was just happy there was a steady bite. The action had been so slow on all the previous trips, even though I’d landed some nice fish, but it was really nice to have a steady bite. 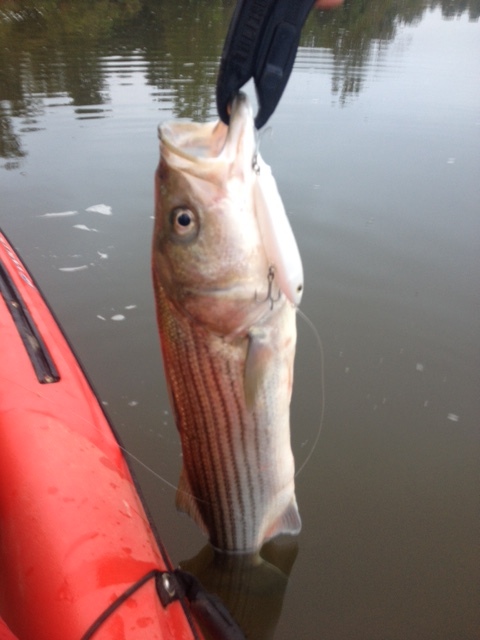 Throughout the day I caught more striped bass, catfish and a few bowfin. All fish were caught on cut shad. The trick today seemed to be to use small chunks as the bite was soft but steady. I used a Carolina-rig setup, but used a very small Texas-rig style weight to avoid hanging up too much in the fast moving water and rocks. 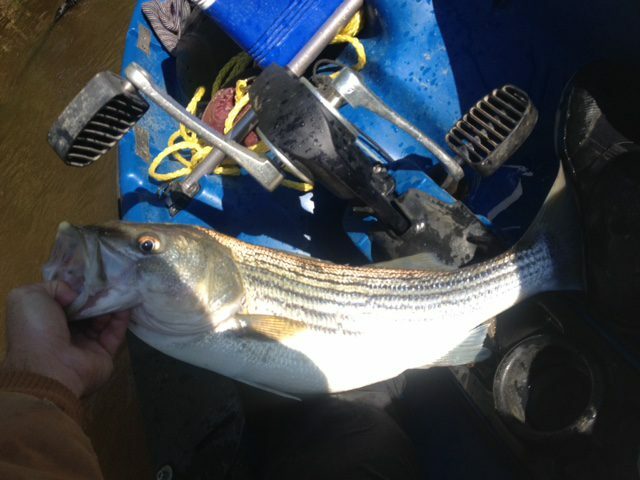 If you have some time and want to catch some stripers the bite is on.